The AVRF series offers high-voltage outputs (to 400 Volts) with fast rise times and wide pulse width ranges. All models operate at pulse repetition frequencies up to 1 kHz. 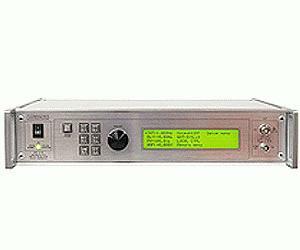 The AVRF-1-B model provides amplitudes of up to 100V, with rise and fall times of 1 ns. The pulse width may be adjusted from 0.1 to 100 us, with a maximum duty cycle of 1%. provides GPIB and RS-232 computer-control, as well as front panel keypad and adjust knob control of the output pulse parameters. A large back-lit LCD displays the output amplitude, polarity, frequency, pulse width or duty cycle as appropriate, and delay. When triggered externally by a TTL-level pulse, the output pulse width may be controlled by the front-panel settings, or it may be set to track the input pulse width. The propagation delay in the externally triggered mode is typically 100 ns. Either output polarity can be provided. (A dual polarity option is also available).